At last the people with the power of the purse strings are beginning to realise that not everything is available online, and what is there is unlikely to be at a reading level accessible to our developing readers, and publishers are responding to the resurgence in demand for quality non fiction resources in print format. While DK have continued to produce quality print materials throughout this misguided era of everything having to be screen-based, their new Life Stories series, biographies for younger readers, is a welcome addition to a genre that can be the entry point to a world of inspiration for a new generation. Currently comprising about a dozen titles, including most of the usual subjects found in this sort of series, the one that caught my eye was that of Katherine Johnson, she who is now the famed NASA mathematician and one of the subjects of the best-selling book and movie Hidden Figures. Miss 12 was just awarded her school’s Science and Technology prize for her work in coding and so this is just perfect for inspiring her to maintain her passion and continue to break down barriers as she moves on to high school. Using accessible text, photographs and the usual DK production quality, this series tells the stories behind the celebrities bringing them alive for students who now understand that their world is much larger and older than they are and that many have gone before as pioneers, often against incredible odds, so that they can enjoy the life they do. Perhaps others would eventually have done what Katherine Johnson did, but for Miss 12 who has the self-doubt and mood swings so typical of her age group, it is Katherine’s story of resilience and determination that is as important as her achievements, just as it is for all the others featured in this series, so it is inspirational on many levels. When she feels overwhelmed, hopefully she will draw on Katherine’s story to find the courage to take the next step. That sort of engagement doesn’t come from reading a dispassionate fact-and-figures webpage and so this book in particular and the series in general will be a superb addition to both private and school libraries this year. This entry was posted on January 14, 2019, in Biography, History, Independent Readers, Non fiction, Older Readers, Resilience, Review, Series. On January 17, 1977 “in a land far away, where fairies, pixies and elves live deep in the woods,” a baby girl was born. To her parents she was Mamie, but to generations of Australians she is May Gibbs, creator of the iconic literary characters the Gumnut Babies. In this centenary year of the publication of Snugglepot and Cuddlepie, Tania McCartney has created this stunning tribute to Mamie’s life, tracing the early years of the little girl with the big imagination who could draw as soon as she could walk, staged home-made musicals and who became fascinated with the Australian bush and its creatures after her family moved to Adelaide and then Perth when she was just a few years old. Told in a way that engages and enchants, rather than a litany of sterile facts – “she skipped and rode through shimmering bushland where smooth grey trees dipped their blossoms-heavy branches, and birds gathered to trill and chatter” – McCartney not only brings the world of May Gibbs to life but also puts dreams in the head of any young child with an imagination. May Gibbs was just an ordinary little girl who did wonderful things as she grew up, so why not them? Mamie also introduces young readers to the genre of biography and the concept of the stories behind the stories. Instead of the usual dispassionate collection of dates and milestones that are soon forgotten, we see the person and how her eventual legacy was shaped by the very ordinary days and deeds of her childhood and circumstances. Perhaps other important people have a similar story to tell too. Just as Gibbs had her distinctive style, so does McCartney and it is this modern interpretation that is such a big part of the appeal of this book. This is not a stodgy piece of close-formatted text with deadpan pictures in a dull retro palette – it is as fresh and alive as Mamie herself was, full of plans and actions just like so many little girls today, finishing at what was really just the beginning. This entry was posted on November 26, 2018, in About Australia, Australia: Story Country, Author/ Illustrator Study, Biography, History, Non fiction, Picture Book, Review, Teaching Resource. On a beautiful autumn day, Mr Walker sat in the back seat of the car feeling very excited because he was going to be the Guide Dog ambassador of a park. Even though he didn’t know what “ambassador” meant, he loved parks, especially rolling in the dirt and playing fetch with sticks. So he was really confused when the car stopped outside a tall building, and when he got out his paws slipped and slid on tile floors instead of gripping the grass he was expecting. Turns out Mr Walker was going to be the ambassador for the Park Hyatt hotel in Melbourne. 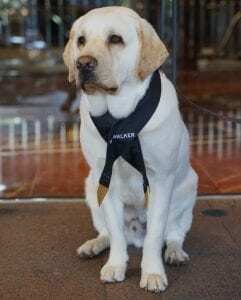 Because of his larger-than-life personality it had been decided that he would be better meeting and greeting the hotel’s guests, including important people and celebrities and raising awareness of Guide Dogs Australia. Written in a chatty narrative that will appeal to all those who love stories about dogs, especially true ones, this book contains four illustrated stories about Mr Walker’s adventures at the hotel -where he still remains lounging on his custom-made Tasmanian oak bed. All royalties from the sales of the book are being donated to Guide Dogs Victoria. This entry was posted on November 9, 2018, in About Australia, Animal Stories, Australia: Story Country, Biography, Dogs, Faction - fact and fiction combined, Independent Readers, Non fiction, Review, Stepping Stone. Despite Australia’s relatively short history, there have been some amazing men emerge from the ranks who have contributed so much to this nation and the world. In this fabulous companion volume to Shout Out to the Girls, young readers can not only learn the stories of familiar names like Adam Goodes, Andy Griffiths, Jonathan Thurston and Hamish and Andy but they can also discover less familiar people like Vincent Lingiari, Weary Dunlop and Mei Quong Tart. Even Australia’s current Local Hero Eddie Woo is featured, making this a celebration of contemporary Australians as much as it acknowledges the accomplishments of those who have gone before. Whoever they are and whatever their story, each has a clear one-page bio and a portrait by one of Australia’s leading illustrators, themselves all men whose work should be celebrated, making this a book that will attract the young reader out of interest rather than just being a resource for “Investigate the life of a famous Australian”. It has its place as a kickstart for that sort of inquiry as young researchers are led to learn more about their chosen hero, but more importantly it will affirm and inspire. While there may be many who aspire to be the next YouTube sensation like Troye Sivan, perhaps there will be another Jordan Nguyen who has developed a mind-controlled wheelchair or David McAllister who was born to dance and didn’t let gender stereotyping stand in his way. This is an exuberant, uplifting book that needs to be in every library collection and promoted so our boys can find new role models, new directions and even new dreams. As with Shout Out to the Girls, all royalties are donated to The Smith Family. This entry was posted on August 21, 2018, in About Australia, Australia: Story Country, Belonging, Biography, Boy Appeal, Courage and Determination, Identity, Inclusivity, Non fiction, Older Readers, Review, Teaching Resource.